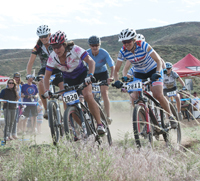 The 13th Annual Wood River Cup short track mountain bike races wrapped up its fifth and final races on Wednesday night at Old Cutters Park in Hailey. Pulling in the fastest times were Josh Berry, Liv Jensen and Terry Durran. The series wrapped up at the Croy Creek trailhead which was followed by the awards party at Powerhouse Fit Studio in Hailey. Men A (Cat. 1/2): 1—Josh Berry 43:34.7 (20 laps). 2—John Reutter 44:28.3. 3—Brad Walker 45:10.8. 4—Julian Gomez-Villafane 45:19.8. 5—Cameron Lloyd 45:40.2 6—David Harrison 46:11.7. Others: -1 lap, Dien Tourssaint, Terry Durran, Greg Bearce and Darren Lightfield. -2 laps, Chris Gardner. -3 laps, Todd Byle. -4 laps, Herberth Corrales. Women: 1—Liv Jensen 26:38.9 (9 laps). 2—Simone Kastner 27:36.6. 3—Muffy Ritz 27:48.0. 4—Kirsten Dehart 28:02.5. 5—Tori Canfield 29:16.6. 6—Jane Kraft 29:31.0. 7-Luma Randolph 29:42.8. 8-Renee Shelton 29:55.4. Others: -1 lap, Anja Jensen and -3 laps, Kaia Jensen. Men’s Sport: 1—Terry Duran 26:14.4 (9 laps). 2—Josh Glick 26:40.6. 3—Herberth Corrales 27:00.1. 4—Brian Kriesen 27:25.3. 5-Henry Raff 27:25.3. 6-Chris Kastner 27:41.6. 7-Hank Dart 27:45.8. Others: -1 lap, Jeff Lyon. -2 laps, Zane Lyon, Walter Kriesien.